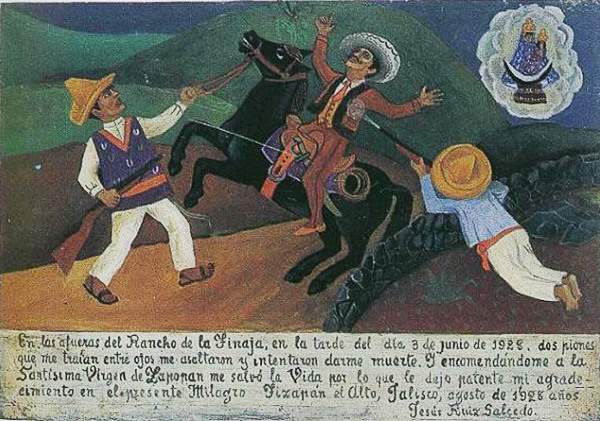 June 3, 1928, I met two strangers near the ranch de la Tinaja. They tried to kill me. 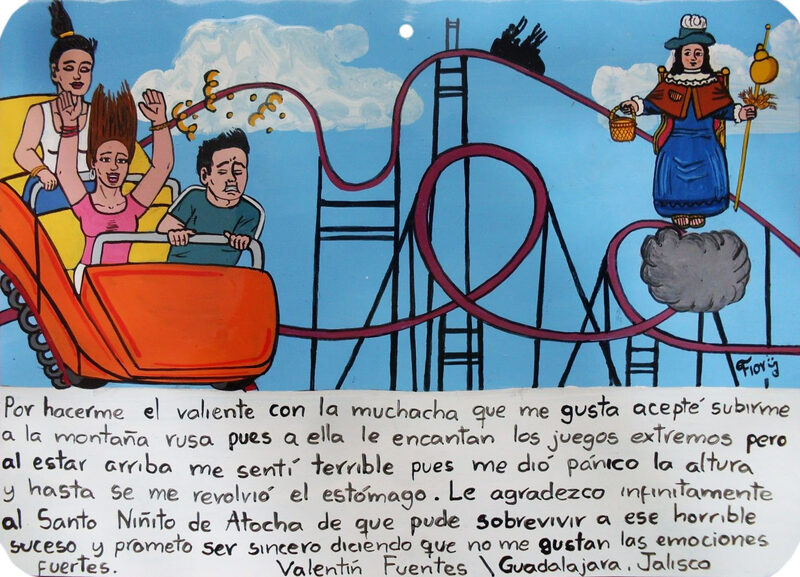 I entrusted myself to the Virgin of Zapopan, and she saved me. 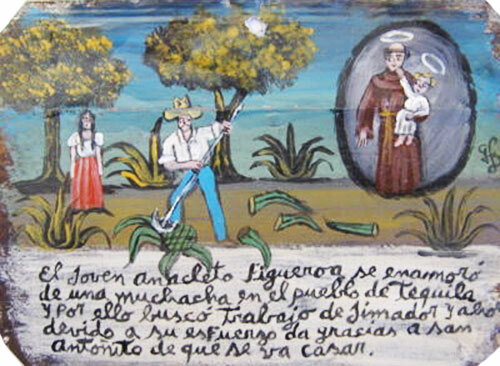 I bring this retablo in gratitude for this miracle. 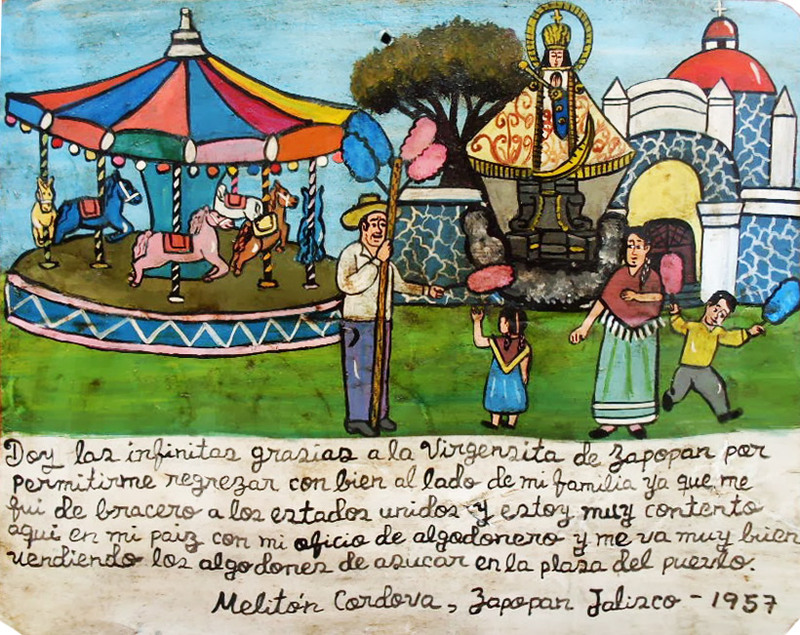 I thank the Virgin of Zapopan for looking after me and helping me to come back to my family. I went to the USA for work, and I’m happy to be back in my home country. Now I’m selling cotton candy at the town square, and the things are going well. 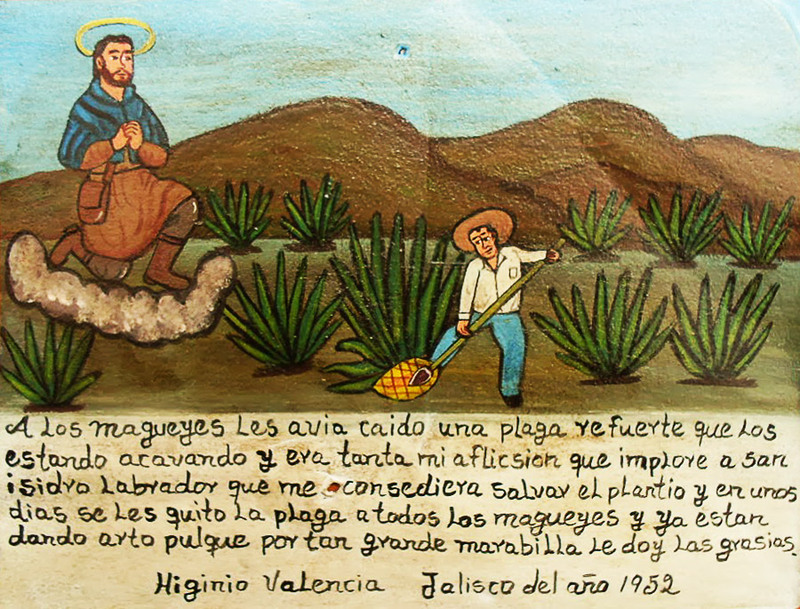 There was a bad plague hitting my agaves, and many of my plants were dying. I was so distressed I implored Saint Isidor Labourer to save my plants. Few days later all my agaves were cured. Now they give a lot of pulque. I give thanks for such a great miracle. 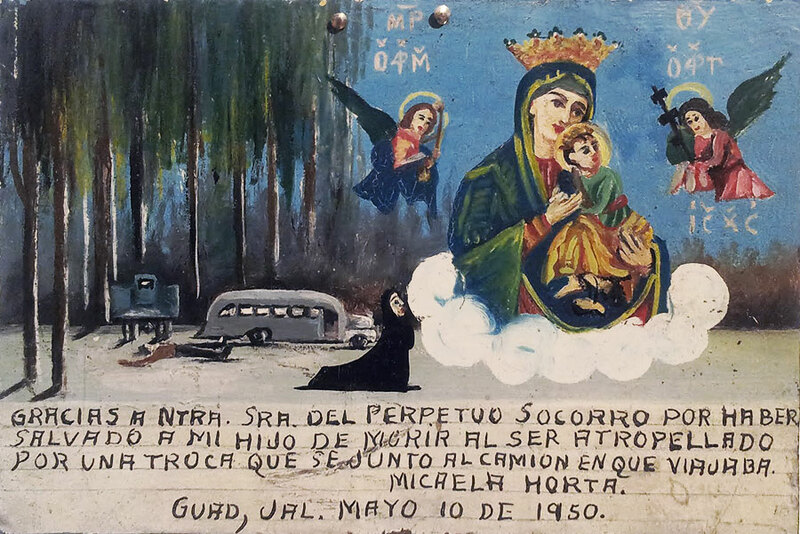 I thank the Virgin of Perpetual Help for having saved my son from dying when a truck hit the bus in which he traveled. 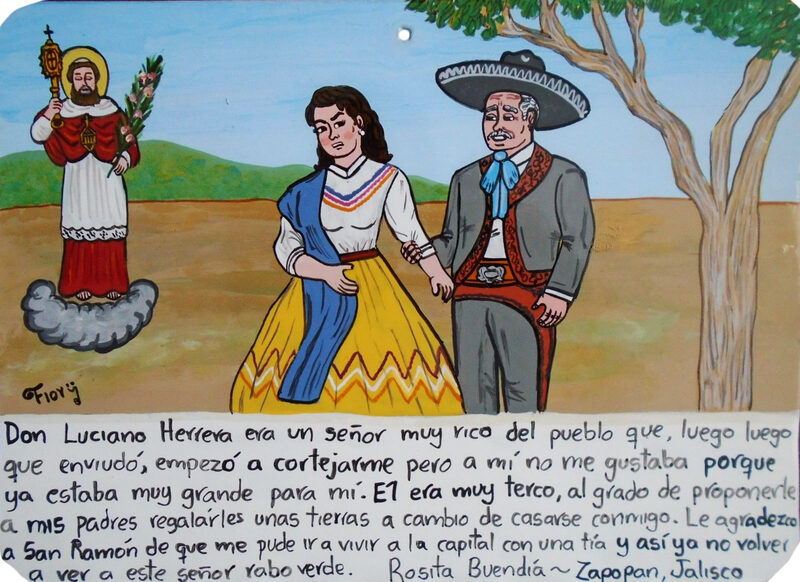 Don Luciano Herrera was a very rich man in our town. After having widowed, he began to court me. I didn’t like him because he was much older than me. But he was stubborn and even offered some lands to my parents in exchange for marrying me. I thank Saint Raymond for I managed to go live with my aunt in the capital and I’ve never seen this dirty old man anymore. There was a very pretty girl in our town that I liked very much. One night I embrace myself to give her a serenade without any idea that she had a very aggressive and grumpy father. 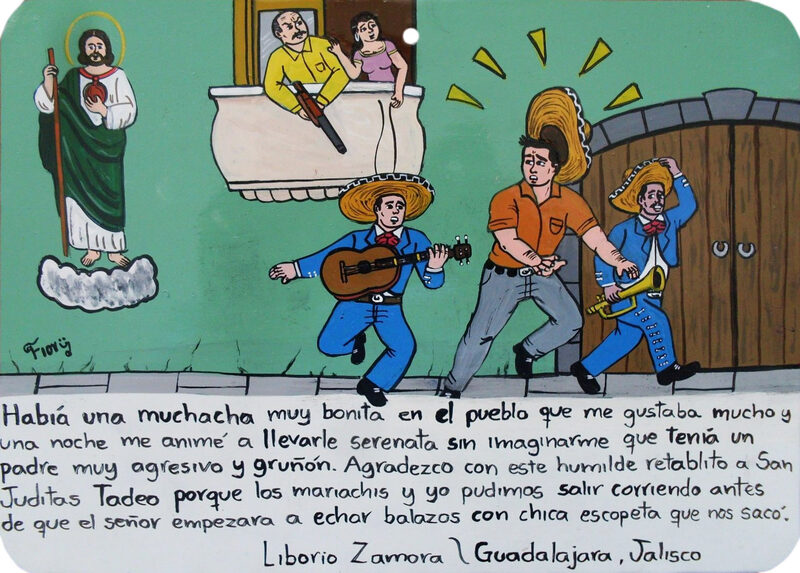 I thank Saint Jude Thaddeus with this humble retablo because the mariachi and I could escape before he started to shoot at us with a shotgun he pulled out. 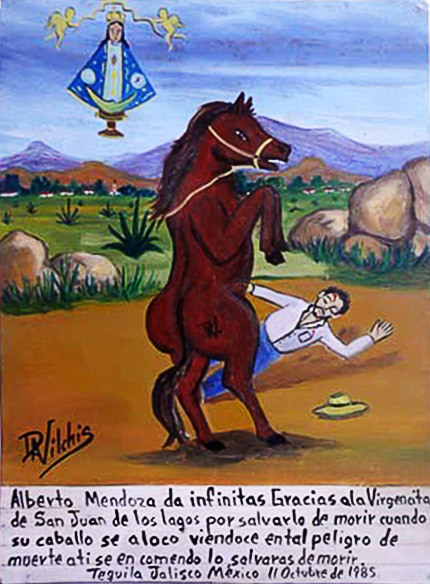 Alberto Mendoza thanks the Virgin of San Juan for saving him from dying when his horse got mad. In this mortal danger I entrusted myself to you to be saved from dying. 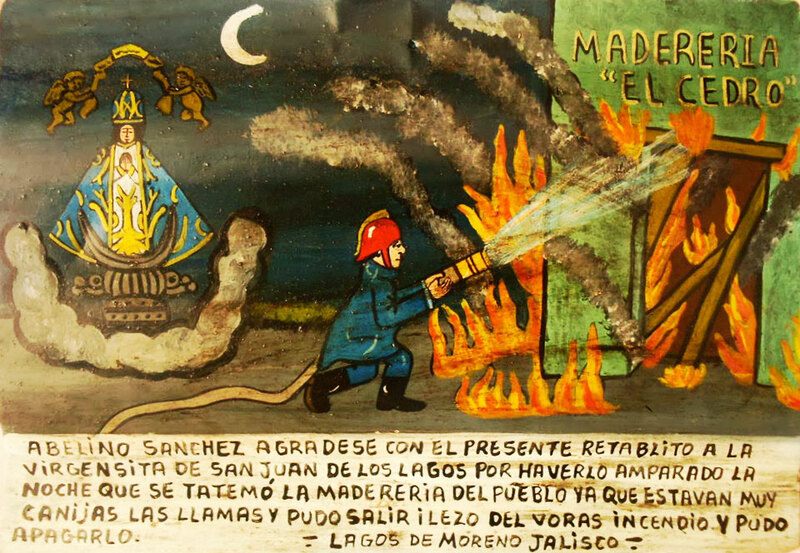 Abelino Sanchez thanks the Virgin of San Juan for protecting him that night when the town lumberyard got on fire. The flames were very powerful but he managed to break through without burns, get to the fire and extinguish it. 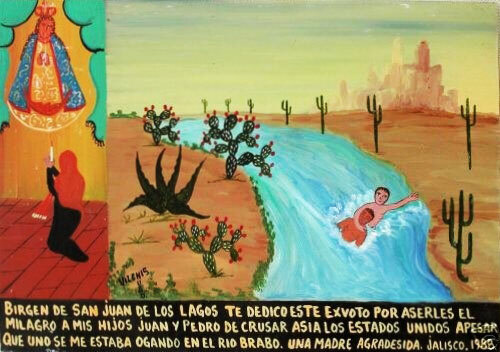 Holy Virgin of San Juan, I dedicate this retablo to you for letting my sons, Juan and Pedro, cross the Rio Bravo (Rio Grande) and get to USA, in spite of one of them being nearly drowned. 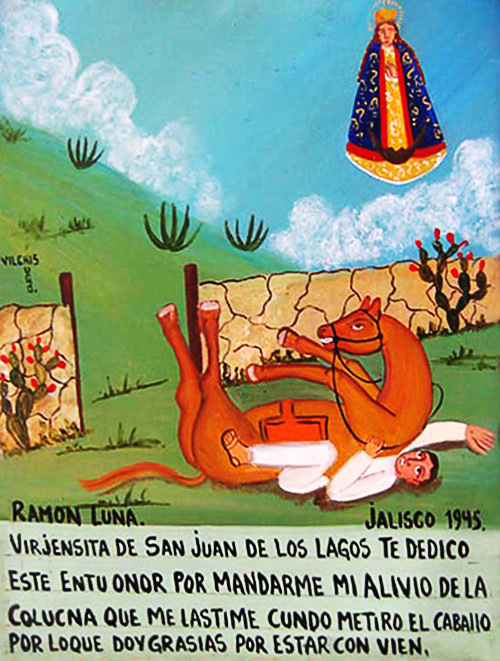 Virgin of San Juan, I dedicate this retablo to your honor because my spine is alright. I injured it when the horse fell on me. I thank for staying well.